What future the Second Ave. Subway? Before leading us into the cavern of the 7 line extension last Friday, MTA Capital Construction President Michael Horodniceanu spoke at length about the megaprojects currently under his auspices. We know the story of the city-funded 7 line extension and the ever-ballooning costs and construction timeline for the East Side Access project. We know too that Phase 1 of the Second Ave. Subway is currently on pace for revenue service in December 2016 even if initial reports seven years ago predicted a 2012 finish. But what of the rest of the project? During his talk on the MTACC, Horodniceanu mentioned in broad sweeps the future of the Second Ave. Subway. For many years, MTA officials refused to speak much about Phases 2-4 of the project. They were focused on securing funding for the remainder of Phase 1 and ensuring that this part of the long-awaited East Side subway line would truly see the light of day this time around. After three failed attempts at building the line, after all, and with billions of dollars in federal money on the line, the MTA couldn’t afford to let this opportunity pass. Now, though, we’ll have a subway that connections from the BMT Broadway stop at 57th St., swings east to 63rd and Lexington and continues north to 96th St. and Second Ave. It is Phase 1 of a four-phase project, and maybe one day, when the 2015-2019 capital plan comes up, the MTA will look for more funding for future phases. Of course, as Horodniceanu explained, the irony is that with some extra money now, the MTA could have built SAS up to 115th St. Since preexisting tunnels connect from 99th St. to 105th and from 110th to 119th, the MTA, said Horodniceanu “could now build stations at 105th St. and 115th St.” The cost would be a cool $750 million – $1 billion per station, but the only obstacle is the money. The environmental impact statements are completed, and the tunnels themselves are in place. In fact, some of the tunnel north of 99th St. will be used as tail tracks for Phase 1. Of course, as we know, the MTA isn’t going to build those stations any time soon. In fact, we don’t even know if future phases of the so-called stubway line will see the light of day. On Friday, Horodniceanu estimated that the remaining three phases could cost a total of $23-$24 billion. Seven years ago, the four phases combined were expected to cost a total of $16 billion. By the time the authority puts their shovels or TBMs into the ground, I’m sure that estimated total will increase to even higher levels. Essentially, the original decision to split the Second Ave. Subway project into four phases doomed it from the start. The origins of that decision these days have always been a bit murky. Some have said it came about due to pressure from Sheldon Silver and the realities of funding. The MTA didn’t think it could secure the full funding amount at the start and tried to break the project into more palatable pieces. A Times story from 1999 tells a slightly different story: “Transit officials said they had limited the plan for new construction to upper Manhattan because of the engineering difficulties and expense of extending a new line under the more congested parts of midtown.” In this telling, it almost seems as those Phases 3 and 4 were simply for show. Phases 1 and 2 were easier and cheaper, but the charade of Phases 3 and 4 could keep hope alive. The truth is probably somewhere in between. Today, we live with this decision. We’ll have Phase 1 at least, and Phase 2, while also expensive, should see the light of day. Beyond that, it’s anyone’s guess. Phase 3 through Midtown will be a challenge, and Phase 4 through Lower Manhattan will be too. The MTA though made this bed 13 years ago, and today, as the pace of construction slows and costs go up, we live with it. A billion dollars per station?! Good question. THAT is the problem. But Ben has missed an important point. The original Phase I was up to 125th Street, plus a light rail line for the East Village and along 14th Street for transfer to the subway. Silver objected to the fact that HIS neighborhood would not be getting the subway, and stopped it, allowing East Side Access to go forward. Had that not happened, we’d have the subway built to 125th Street right now, probably finished, and would be arguing about going south of 63rd St.
For Pataki, meanwhile, Phase I was for show. His goal was investment paid for by the city to benefit the suburbs — East Side Access — with as little for the city as possible. Silver played right into that. I remember Sheldon’s tantrum, but I don’t remember the light rail thing ever being thrown about officially. No doubt if it did come up politicians would scream at the MTA to “save” money by using buses, and most transit advocates would probably agree. For that matter, I’m rather shocked there aren’t more calls for the SAS to just be BRT. Get rid of the rails and tunnels and let the bus fairy take care of the rest! That was the original plan, and was analyzed in the original EIS. Silver made them do a new EIS for a “full length” SAS, knocking the project back two years. Sometimes Shelly can be a card. OK, what is the source of the station costs? These are cut-and-cover stations, not deep caverns. Utility relocation? Some of the utility relocation has already been done, in the 1970s. Building stabilization? We saw how decrepit the buildings on Second Avenue are. It’s got to be possible to build a cheaper cut-and-cover station than this. I think a “Phase 1.5” that would continue up to 116th St. (for now) would be a practical way to extend the line beyond just three stations as so much of the tunnels already exist. Once opened, the line would serve a depressed area and quickly spur new development. Unfortunately the left turn on to 125th St. and the terminal far beneath Lexington Avenue will cost a fortune (and will make obtaining funds that much more politically difficult). Seems we have a chance here to grab some low hanging fruit until another generation finds a way to complete the entire project. And for the record, I believe the line should ultimately extend west on 125th at least as far as the 8th Ave. IND, and perhaps beyond. +SBS+ is going to be (unfortunately) the more realistic alternative, but this begs the next question of because there are so many bus routes on 125, how they get re-aligned such that both +SBS+ and the ‘regular’ routes co-exist? The M60 should be the SBS, only stopping where there are subways. The other routes should be the locals. If the MTA didn’t try to brand SBS as something completely different from normal buses, your question wouldn’t be so relevant. All buses should have proof-of-payment fare collection, and key streets, including 125th, should have separated bus lanes. Buses are not subways; they can run partially in physically separated ROWs and partially in mixed traffic. MetroCard-based POP requires curbside equipment at each stop on the line. Since the equipment is not going to be installed at every bus stop in the city overnight, a line-by-line approach makes sense. Separated bus lanes only work well if they’re in pairs, so buses can pass each other. How likely do you think it is that four lanes on 125th will be given over to buses? In many European countries, TVMs go in the vehicles, not in the stations. It works pretty well even on coupled articulated LRVs, basically giving the capacity of about four IRT cars. It’s likely cheaper than the NYC method of having TVMs at every stop, plus it allows TVM maintenance to be partially or even fully centralized. Nonetheless, key stations can still have TVMs. Smartcard-based POP requires a validator at each stop and on each bus; Singapore pays under a thousand dollars per validator. It would be helpful if the MTA considered this fact in its smartcard documents. Separated bus lanes work better if there are four-lane passing segments, but they don’t strictly need them. See, for an example I’m relatively familiar with, the bus lanes in Nice. Or, possibly, in Jakarta, where the photos I’ve seen all lack the four-lane stations of Bogota. The new smartcard system will be POP-compatible. Whether POP will be used on all buses or only on SBS remains to be seen. I hope the former, but the decision probably hasn’t been made yet. I’m not familiar with the Nice or Jakarta bus systems. Do they have multiple bus routes, some making more stops than others, sharing the same bus lane? The problem with building overly short extensions is that a terminal comes with its own costs. Each terminal you build, for instance, needs a terminal interlocking. What role would topography play in an extension of the 2nd ave subway to the IND? My view is it should ultimately connect to the 6th ave for further travel north and provide something of a crosstown run, it could have a transfer to the 2/3. I think Phase 4 is essentially worthless and should be scrapped. The walking distances are just too short, those areas are very well served south of Houston. Bend to the WEST between 72nd and 59th for a run to make the 59th st stop for the 4/5 have dual-center platforms and a cross-platform transfer between the 4/5 and the T. THEN, this is even better, in 59th st and south of it, set up gauntlet track (yes, a total of 4 rails per track), and have the 4 run on Phase 3 with the T to the remaining stations under 3rd Ave with direct connections to each Lexington avenue line station via escalators. This would improve capacity of the IRT Lex line, and would make possible adding new service in the North Bronx and beyond, such as a service to Yonkers Raceway parking lots on the 4 (Maybe add a new designation for trains that go there and call it the 8). Have you been on a 4 or 5 train at rush hour from Wall Street? Ideally, the T shouldn’t even end at Hanover Square, it should continue south into Brooklyn with stops at Governors’ Island, and in Red Hook, and then express to Staten Island. It won’t, though, and, because transfers will be a waste of time for people, they will generally stay on the 4/5. The T is going to do little for Lexington Avenue crowding from Brooklyn and probably little for The Bronx. Granted, the T will probably be crowded in its own right, but it won’t be because people left the Lex. I have to disagree. Only because I have a few people I know either live or work on the far East side beyond 3rd Avenue. For those who work over there, they would transfer in a heartbeat. The area surrounding the UN would see people transfer for direct or closer service in a heartbeat. The Lex would most definitely experience true relief starting at 125th. However it won’t help reduce the crowding for those traveling to Queens via 63rd or 53rd. SBS averages about 12 km/h. An old local subway line like the 1 averages 20-25, and the T, without the tight curves and with longer interstations, will probably average 30-35. Yes, every day, from Mott Haven to 14th St, and then back again in the evening. My suggestion would add capacity being able to use existing rolling stock, and would provide access at the same stations, but at a different depth. The T should link into the Chrystie Street connection and be routed from there over existing paths to Brooklyn. Phase 4 shouldn’t happen, it’s a total waste. As to 2nd ave residents, The entrances could very well be near 2nd Ave, considering how deep these tunnels have to be. Mid-block between 2nd and 3rd and 3rd and Lex. Indeed, Chet. Ideally, we’d already have a TBM being sunk on Governors Island just south of Division Road by tomorrow. We’d be driving sheet piles into the bay to the south and west, and all the tunneling spoils would be expanding the size of the island … which, oddly enough, is how at least a third of it was built to begin with. Two tunnels up to Hanover, two tunnels out to Red Hook, and suddenly New York’s newest park has a few more acres to develop and play with. In fact, if you offered the private sector the ability to create acreage in New York harbor on Governors Island, AND deferred their taxes on it for a couple of decades, AND guaranteed the active subway stop … well, you might get them to fund the entire project. Owning acres of land in NYC, with a free hand to develop it, all just one subway stop from the financial district could be worth billions – and it might be worth just enough billions to fund the “T” train extension – at least out to Red Hook. That might add a huge chunk of subway toward an ultimate Staten Island connection. Don’t Stop the “T” Train! Eastern Chinatown is highly underserved. The F at East Broadway provides the only service. Any train at Canal St is a long walk from the east and that doesn’t really change until you get nearer to Fulton St. Except that the route of the second ave line isn’t far enough east relative to the 6 to be worth billions and billions of dollars. They should just connect it to the Nassau line and do a lot of great upgrades to those existing stations – ADA, new entrances, etc. They thought about this when they were doing the original engineering study and was touted as an alternative to building a new tunnel and stations for phase 4 under water street. In other words, build phase 3 to the Lower East Side and upgrade the Nassau Street Line to be able to connect to the Second Avenue subway and carry its traffic. As it stands right now, the subway exits in Chinatown are on the outskirts. Grand Street is usually always crowded because there’s only one exit (and I hope they do add exits when SAS comes along), and a Chatham Square stop would also help to relieve congestion. Personally, I would have SAS Phase 4 turn west after that and go under Chambers Street and then turning to serve Battery Park City. Although it looks as if it’s a short walk, keep in mind that just after Chatham Square, many downtown streets have the NYPD barriers, making east-west travel at the very least complicated. That would be insanely costly to build and to maintain, and with all the twists and turns it would be slow. The gauntlet tracks would require four switches at each station and some sort of specialized interlocking logic to ensure that the switches are set properly for the train width before each train proceeds into the station. It would not improve capacity of anything. And I disagree that Phase 4 is worthless. Water St. is an important corridor that isn’t well served by the subway. I think they should dig a connection to the montuage st tunnel and connect to the R.replacing the m.
This. 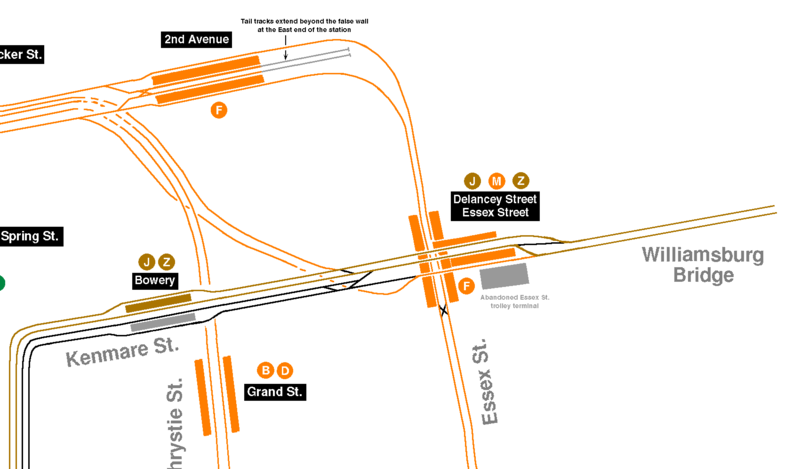 Scratch phase 4 and extend phase 3 by three blocks, to Delancey Street. From there, merge into the unused tracks that go as far south as Chambers Street. The connection to the existing lines would be complicated, but certainly less expensive than digging a new tunnel and building new stations. Not this. The whole point of the SAS is to reach neighborhoods that are currently not served. Unless there is a reason to think a huge pool of potential riders are avoiding the J service now because they’d rather go up Second Avenue, there is little to any point in using the Nassau Street line as anymore than an intermediate terminal. If its only extending the third phase by 3 blocks, isn’t this just useful to have at very little cost? The line would as a whole still serve hoods currently not seeing service (Phase 1-3) as well as provide a downtown terminal if Phase 4 never materializes. The Nassau line is super useless as is right now because it barely does anything in Manhattan. This could in theory funnel people off the Lex way downtown thus alleviating riders further up, no? Have J/Z trains terminate at Chambers and have the T line run through to Broad, or even continue on into Brooklyn as an alternate service on the 4th ave line. If $$ ever materializes for a real Phase 4 (all signs point to no, at least in our lifetimes) then those in power can engineer a way for the line to go someplace downtown lacking service (the fringe area near the seaport perhaps) and have it punch through to BK’s Court Street station i guess. I don’t object to a connection, if it’s possible – it’s certainly useful when work needs to be done. In fact, it might be a good idea as part of a permanent service feature (U Train?) to supplement the T south of 63rd. I really have no idea about the feasibility of a track connection though. Either way, chucking out phase 4 is a bad idea. Heck, Phase 4 is arguably more useful than phase 1 from a connectivity standpoint, though phase 1 addresses more immediate crowding concerns. A Water Street line would provide new service to an area that really didn’t develop as a commercial location until the late 1960s, after Water Street was widened. But if the money was limited for a line south of 63rd, getting it down to Delancey would at least offer up the option of continuing into the financial district and potentially on into Brooklyn at a lower cost than another 1.5 miles of new tunneling. Curious,,….whats the big hurdle that would make this track condition difficult? Is it depth? Depends on the depth of the Second Ave. line. If you brought it into Houston Street in a deep tunnel bore (four or more levels below ground) you’d be out of the way of all the other lines, but you couldn’t ramp it up to meet the Nassau line until someplace between Bowery and Canal at the earliest. And if you sent it down Water Street, a cross-platform transfer at Grand with the B/D trains would be out, since those tracks pass over the J/Z at Delancey and Christie and are only one level below ground. If you brought it into Houston St. basically three levels below the streets, which is where it was going to be with the 1970s tunneling between 2nd and 9th streets that eventually was filled in, then a cross-platform transfer at Grand could be done (though it would be a tight fit for the uptown tracks) or you could connect the Second Avenue line up to the Nassau St. line just east of the Bowery station (though you’d have to do a jughandle turn that could accommodate 75-foot trains over the J/Z tracks at Forsyth Street that would be similar to how the southbound 5 reaches the Lex line from 149th-Grand Concourse). 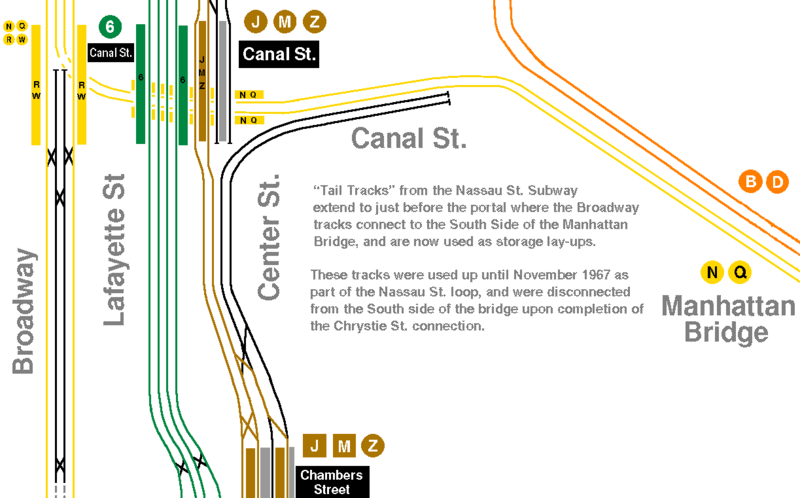 And any connection to Nassau Street would have to include reopening the unused tracks at Canal and Bowery and realigning the J/Z to use the middle tracks at the T to use the outer tracks (since the middle tracks dead end south of Chambers, while the outer tracks are the ones that continue to Fulton and on to Brooklyn). I’ll mainly defer to John-2’s comment I guess, since I just didn’t know. I don’t know if there is a problem, but the Chrystie Street connection may pose some challenges. There are some funky tail tracks north of Chambers. There is the Chrystie Street connection itself. I dunno, the whole area is a bit of a clusterfcuk. Well, the J and Z trains are 480 feet long, as opposed to the best of the BMT/IND trains which are 600 feet long. So to use the Nassau line as a substitute for phase 4 of the Second Avenue subway, it may require station upgrades. No “may” about it – the platforms are not long enough. Canal is probably relatively easy to fix, but Fulton would require regrading the tracks and Chambers would require moving an interlocking and possibly also regrading the tracks. Broad might also require moving an interlocking. If the J/Z terminates at Chambers, then the J/Z isn’t serving the Financial District anymore. Have you seen how crowded those trains are going into Broad? For what you term a useless line, it carries quite a lot of people. The line has already lost the M, and M riders from Brooklyn and Queens have to transfer to the J/Z to go downtown. You want them to have to transfer a second time, to the T? If there is a transfer elsewhere between the T and M, that scenario might actually do the M riders a favor if it does what he says and goes into Brooklyn – though that would seem to present its own logistical problems. The people most screwed over by the new M arrangement were those who needed to get from northern to southbern Brooklyn, though I suppose there weren’t many of those anymore. Sorry if I wasn’t clear. I’m referring to M riders on Broadway-Brooklyn (the three local stops that the J/Z bypasses) and the Myrtle line who work in the Financial District. They used to have a one-seat ride. Now they have a two-seat ride. JB’s proposal turns it into a three-seat ride: M to J/Z to T.
The number of people who rode the old M from Brooklyn to Brooklyn is negligible, and most of them have a two-seat ride now. Yeah, I took him to mean the J/Z would stop at Chambers and the T would go to Brooklyn. All that’s needed to make that “work” (well, at least from a routing standpoint) is a transfer from the M to the T in the vicinity of Chrystie Street, right? Although, that seems to have its own problems…difficult at best at Essex if there is going to be a track connection, and Broadway-Lafayette seems a little too far to the west. Plus, the other people who seem to get screwed by his proposal are actually J riders, who suddenly will have to transfer to get to Broad. There could always be a rush hour extension of the J/Z to Broad, depending on its TPH and the TPH of the T, and how that would work in turning trains south of the station (the alternative would be to connect the T to the center tracks on the line and terminate it at Chambers and continue to run the J/Z to Broad. 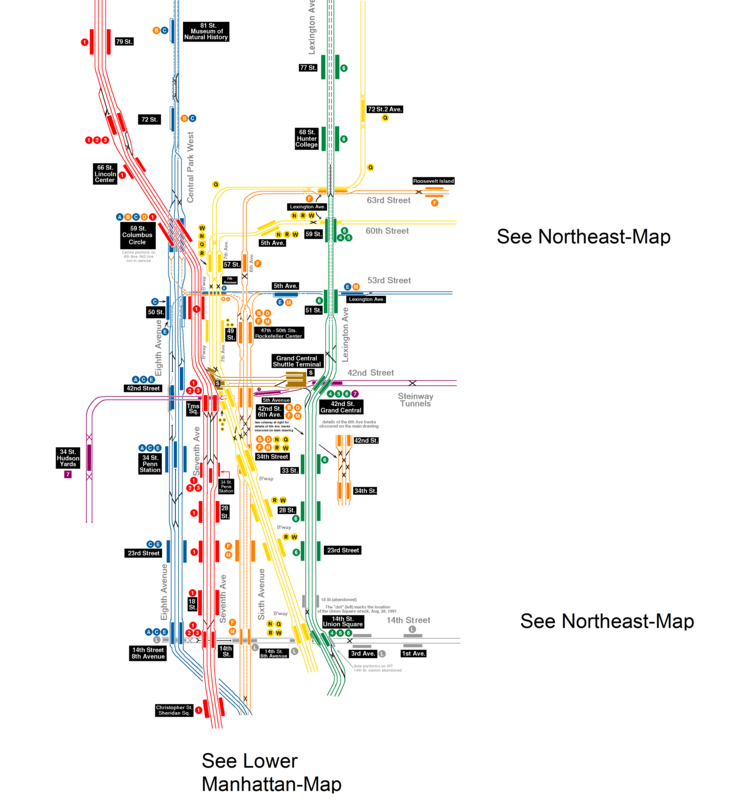 But that pretty much defeats the purpose of connecting Second Avenue to the Nassau Street line in the first place, since the goal would be to make the T bi-directionally functional, so that trains coming from Brooklyn could deposit riders both downtown and in the Midtown East business areas). Rush hours are when service is most frequent. The J/Z runs 12 tph, and if we say 10 tph for the T (I’m guessingI don’t think it will run any less than that), we’re up to 22 tph terminating at Broad. I don’t think any relay terminals turn that much service – Continental gets pretty clogged up at 20 tph. The J/Z trains may be crowded, but they only come every 5 minutes at the peak. There’s room for another line to share their tracks. Andrew is probably absolutely right about the short platforms though; hard to overcome. OTOH, there is no reason why the T couldn’t simply skip the stations that are too expensive/difficult to extend. Bowery to Broad express? Maybe Chambers could even be used for well-timed, scheduled passing. Bowery to Broad express misses all three transfer points! A passing siding wouldn’t work here, and not only because Chambers has only two through tracks. That’s true, and maybe I should have said Canal to Broad express, but I thought Bowery would be easier because it at least offers a potential four-track option at the junction. But the transfers may be of limited importance under JB’s (?) scenario of a through service to Brooklyn. Most SAS riders will have had better opportunities to transfer to west side-bound services uptown, and would have decent enough opportunities in Brooklyn to catch the 4/5 if it’s desirable. It’s not perfect, but it meets the goal of getting people downtown quickly and relatively cheaply. One other interesting point: the easternmost, abandoned platform at Chambers (see track map) looks like it could be extended without much difficulty. Could the other abandoned platform be extended by the extra ~120 ft? And is there any way to provide a track connection from the inner tracks to the outer tracks from the south? IIRC, the elevation starts dropping rapidly at the southern end of those platforms. I don’t know if the east side platform can be extended, but the west side platform was obliterated in the 60’s when Brooklyn Bridge was reconfigured and extended. Andrew is probably absolutely right about the short platforms though; hard to overcome. That’s certainly true. I was implicitly thinking that the T could run shorter trains, but with the expected demand for service along Second Avenue, it would probably be an unacceptable cut in capacity. Are you kidding? OF COURSE there are a ton of people who avoid the J downtown because it doesn’t go uptown. The Nassau route is the single best route through lower Manhattan, hitting key locations at Wall St, Fulton St, Chambers, Canal St, and Soho, and it has convenient connections already built in including station transfers and track connections to the Montague Tunnel. Yet, it’s underused. Combing the 2nd Ave subway and the Nassau subway would make both of them much better. The proposed second avenue route only connects to Grand St and no connection to Montague Tunnel or any new East River tunnel is currently planned. I would love to see this happen just to see them restore the Chambers street station. I’m down there everyday and am amazed at how unique the place is and yet how neglected and abused its become. I’ve actually been in the abandoned north mezzanine that’s now the Municipal Building’s basement…all the wall tile and mosaics are like they were the day installed in the 1920’s. Awesome. Where is this? There’s an existing north mezzanine, well north of the Municipal Building. Where’s the one you’re referring to, and, more importantly, can you get us in? I’m talking about the original mezzanine then, the one that would of connected the north side of One Centre Street (which was sealed up long ago and turned into office space) and the south side of One Centre (which is the main entrance). If your infront of One Centre, look at the ground and youll see old glass that let sunlight into the abandoned mezz…you can also see it from the J/Z platforms where the ceiling drops and there is an old hole/portal for what i imagine was a staircase. There are clues everywhere in the station where you can see access points to the mezz, mostly on the side platform and abandoned middle platform. Getting in there isnt easy though, i had employee access as security but no longer work in that field so its much harder. From what i remember, the mosaics are burnt red but still shiny as the day they were installed, plus the standard BMT diamond motif seen in the remaining open parts of the mezz/main entrance. How could you give up a job with such a fantastic perk? Any idea when this was closed? No, I’m not kidding. I know there are some, but how many is “some”? Downtown, even Wall Street, isn’t what it was a century ago. And the employment seems pretty well-dispersed from South Street to the World Financial Center, so I might dispute the idea that the Nassau Line is all that. And note my comment to JB; I didn’t say I was against a connection, I just think Phase 4 has a lot of merit too. People pick their downtown lines by where they live, not by which line gets them closest to work downtown. They’re all very close downtown. Yes, the J is in a great location, but the IRT is a block away in either direction, which is good enough for anybody looking for Nassau. Water is far enough east that it would be a useful addition to the network. I like the idea of modifying Phase 4 to serve Nassau Street mainly because you don’t need to build the East River Tunnel, and thus the T can serve 4th Ave in Brooklyn (plus there’s plenty of capacity for more trains there). The problem is that there’s no real need for extra service on 4th Avenue. The direst service need is on the UES. The rest of the East Side could also support high ridership, though the T would not be as useful as the Q extension. Once the trains hit Lower Manhattan, there’s no point in further extensions – southern Brooklyn trains are among the less crowded, and the only routes from Brooklyn to Manhattan that are really crowded are the L and the A/C. Part of the point of Phases 3 and 4 is to connect the Upper East Side with Downtown. If they go away, a second service along the SAS which becomes local on the Broadway BMT (the N would have to switch to express, which it does after Prince St anyway) could follow the R into Lower Manhattan and terminate at Whitehall St (which has a third track to short turn trains) to provide that service. Crossing the Q from express to local and the N from local to express is a recipe for throwing away capacity. When the plan only consisted of a “stubway,” the plans included rejiggering the tracks at Canal so that the express would run through lower Manhattan and the local would go over the bridge. Yes. Relooking the connection at 57th St, I see that the express platforms would create a bottleneck. But if Phase 3 doesn’t happen, and Phase 3 is very likely not to happen, then we have unused capacity along Second Ave, unused capacity along the BMT Broadway express tracks and unused capacity on the BMT Broadway local south of Canal St. Plus the closest Second Ave riders can get to the financial district on a one seat ride is Canal St. Which cries out for some way to use that unused capacity to get Second Ave riders a single seat ride into Lower Manhattan. I’m not so sure of that. Remember that, when SAS opens, the W will be coming back to maintain current service levels to Astoria. There’s no one-seat access from 6th Ave. to the financial district either. I don’t see that as a fatal flaw to SAS. Bruce brings up a good point. 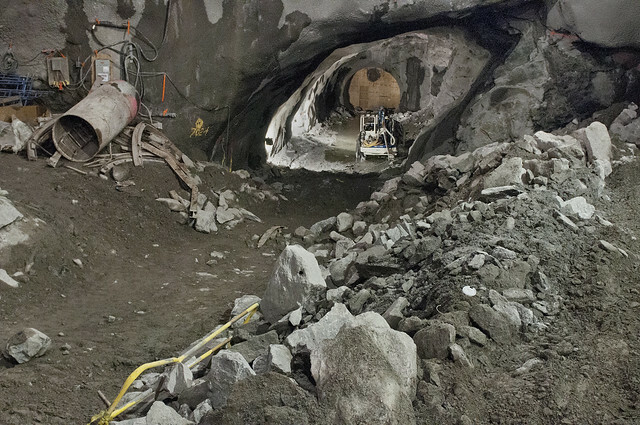 The underpinning of the Lexington Ave station at 125th street to bring the Second Ave Subway underneath it, and the eventual passenger connections between the existing IRT and new station is where the bulk of this cost goes. We’ve seen the disruption on the surface to Second Avenue due to subway construction, I can only imagine the disruption to 125th Street. But I believe the phased approach is the right way. Otherwise we’d have tunnels dug from 125th St. to Hanover Square with nothing to put in them. Following the logic with the cost overrun on the #7 line extension, when money gets tight, they’d eliminate stations, making a super-express with stations 30 blocks apart. Would be a good excuse to implement bus-only lanes and BRT improvements to the M60 bus (or whatever is linking Harlem to Astoria and LaGuardia by then) once that stretch of 125th is torn apart and traffic patterns have to be disrupted. Note that 125th between 2nd Ave and Park Ave isn’t the vibrant business district it is further west. The Pathmark, the DMV, and all the methadone clinics are major trip generators but otherwise most of the traffic there is going somewhere else–people transferring between Metro-North and the 4/5/6, people transferring to buses across town or to the psych/drug treatment facilities on Randalls Island, drivers and truckers heading to the Triborough. It’s pretty different from 2nd Ave on the UES, which is a local retail spine for a densely populated upper-middle class neighborhood. Upper Second Avenue could get a boost if the new line proves to be successful in both sipohning riders off the upper Lex and boosting economic development around the stations once it opens. And it would help if the same phenomenon occurs even more in the area around Hudson Yards when the 7 extension opens — if people outside of railfans can see ways to make more $$$ by further expansion of the subway that could boost real estate and other values north of 96th Street, they’ll back addition funds for the 96th-125th segment connection. If the MTA logically sends all the B’way express trains up 2nd Ave to maintain good headways, then expect Phase 1 to be so popular that Phase 2 will become a natural extension over the next 15 years. The 125th Street line makes sense, but politically it doesn’t really have support right now. I don’t expect Phases 3 and 4 to be built in the near future, however. Maybe to 14th Street to serve Midtown East and free up capacity for a potential Northern Blvd line when it becomes inevitable, but the 4/5 will be much faster on the East Side. Essentially, the T would be an A/C train, hardly what riders want. Now what I don’t understand entirely is why the estimated cost for Phases 2, 3 & 4 have increased 50% in 7 years. We are in a protracted recession and some would say a depression! And that means that prices for many commodities, building materials in particular, should be less or static because the demand for them is less. Same for labor costs. The whole problem is that wages, work rules, and probably cost of living velocity are static. And even if they’re not, they’re stupidly high. And, regardless of whether you think there is a recession, growth recession, depression, God’s wrath, or just long-term American decline, raw materials aren’t exactly getting cheaper now that perhaps a billion more people are competing for them in a way that they weren’t a decade ago. My uneducated guess is the local game in the political-union continuum is mostly to just limit the pool of potential contractors. There are only so many firms that can actually do work necessary to pull off a project like SAS in terms of both engineering and administration; in the case of the SAS it is a consortium of Schiavone, Shea, and Skanska. Maybe a handful of other firms could do the same work, together or separately, but you can’t really go and shake any of them up because you know you might need them again in the future. There is no need have such complicated rules, and if we didn’t we could probably use smaller local firms more. Either way, it makes the conservatives (they’re called Democrats) happy because the unions are cared for and won’t get uppity, and it makes the oligarchs happy because big political bucks can still flow into the coffers of potential donors. I think the answer is a bit simpler than Bolwerk’s explanation: Seven years ago, the MTA had no clue how much any of this would really cost. Today, they’ve built out the 7 line, dug out SAS Phase 1 and have a much better sense of what number they can expect from contractors bidding on future projects. The new figure is far more realistic than the old one, even if both are high. That may be true, but contractors have been inflating the costs all along on SAS, ESA, and even to an extent the 7. You can throw ARC in too. Why aren’t contractors severely penalized for getting work in late or over-budget? Part of the answer, I suspect, is there are only a few of them who can do the job that is put to bid, and you can’t piss them off. I dunno, maybe I’m wrong, but Googling around at bids for this stuff seems to give you a lot of the same names again and again. Most of the technology used to make tunnels is not exactly proprietary or mysterious. Hell, it has scarcely changed in principle in a century. The issue is that not many companies are qualified to do this kind of work. That’s why the same names pop up over and over again when you Google bid info. What work though? Tunneling? It’s not exactly a narrow field out there. Things only get easier when you’re talking about laying track and building stations. Any railroad or transit agency can do the former and many construction firms should be able to handle the latter, though perhaps it gets more complex in these deep bore scenarios the MTA insists on. A more likely explanation is only a few firms that can do the work (in-house?) can also follow the rules imposed by myriad federal/state/local/MTA bureaucracies and union agreements. I buy that technical complexity raises costs, but I don’t buy that it raises them by an order of magnitude over other countries. There’s also bonding and surety. This is complicated legal stuff, but simply – it’s the ability of a contractor to have the necessary cash flow on hand to cover the cost of building a major piece of infrastructure (and not just relying on waiting for invoices to be paid by the owner), and having insurance for any self created liabilities. This is a big deal here in NYC; we’ve already seen one contractor default on East Side Access – the original contractor of the Queens Open Cut, which also included the Northern Boulevard Crossing. This had a major budget and schedule impact. The result was that the open cut excavation had to be finished by the Queens Tunnels contractor, and the Northern Boulevard crossing was let as a seperate contract. And right now, they are really behind on excavating under the IND, whereas under the original schedule it should have been finished a year ago. But I digress – the key here is that while it may seem that the same players are the ones doing the work, the reality is that there are only a handful of NY area contractors who can meet the strict financial requirements. There are other national and international contractors who have looked at entering the NY market, but other than a few exceptions (such as Dragados) it’s not easy, and you still have to contend with NY’s onerous labor conditions. And remember, the Second Avenue station contracts were already broken up into smaller procurements in order to open it to a wider field of builders. Otherwise we may not have seen EE Cruz/Tully up at 86th Street and Annunzio at 96th Street. Sorry, meant to say EE Cruz/Tully at 96th Street and J.D.’Annunzio at 86th Street. Thank you for that great insight! Do similar cities—particularly those with lower subway construction costs—have similar strict financial requirements? The implication of that is you need to be big enough to be reasonably expected to stay around. And the implication of New York having 5-15x the upfront costs of doing construction is firms that get contracts also need to be bigger. The SAS contractor I mentioned is a three-company consortium; presumably none of them are big enough or have the expertise to do it themselves. Tunneling has always been done by the Sandhogs. It’s not a heavily competitive practice because nationally how many tunnels need to be dug in any method? Topography is a fine art. Learning where you need to freeze the ground as opposed to just tunneling through or blasting the perfect cavern is not something you want a whole bunch of firms coming to you with the lowest bid. I want the best of the best. I have a to ride a train down these tubes. I don’t want a bolder on my skull. Tunnels have been build for well over 100 years and when have you ever heard of one collapsing? And once the tunnel is dug, they coat the inside with concrete to make it stable? Agreed. The beauty of pre-war subway construction was that it was relatively low-tech, infrastructure building. This does not, however, explain the inflated projected cost for the *shallow* cut-and-cover stations to be dug at 105th and 115th. Digging a basement is *well-understood* work and a lot of construction companies can do it. So then is the answer re-thinking the Phases along the line of what is proposed? 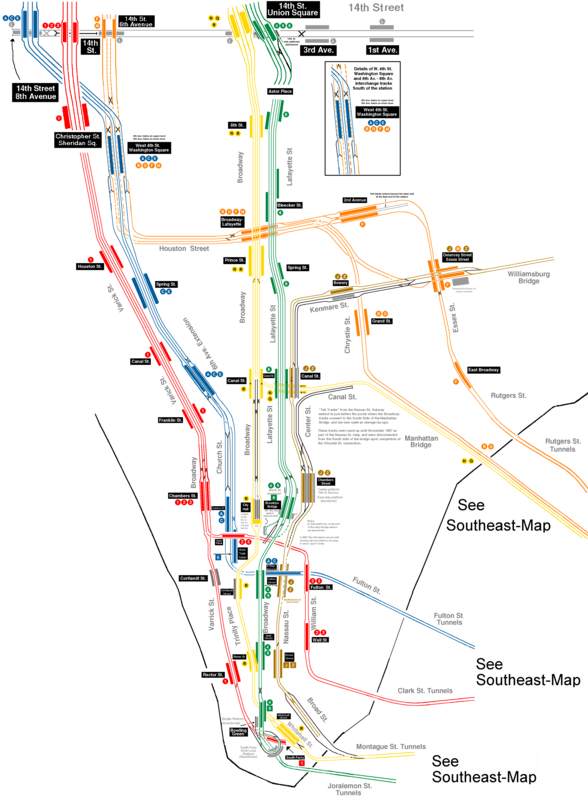 Do a “Phase 1.5” and get two new stations at 105 and 115 for $3 billion (all in figuring new stations plus track work)? i agree with this. keeping some momentum, going in the direction where something has already been done, pushing up to 125th, and talking in dollar amounts that are smaller rather than larger (as the amount would be to build anything going south) are important. …and spending money on a terminal interlocking at each intermediate terminal. A diamond crossover (“terminal interlocking”) is cheap. It’s more of a pain in twin deep-bore tunnels (because you have to have extra excavation for the tunnel crossover), but 105th St and 115th St are going to be shallow cut-and-cover construction. There, the crossover is cheap. There’s no such thing as a cheap interlocking. In addition to construction costs, there are ongoing maintenance costs – which will continue to accrue after the interlocking is no longer needed. Interlockings are really expensive by the standards of trackwork, and really cheap by the standards of bored tunnels, viaducts, and especially underground stations. When you’re building an above-ground regional rail line, it’s important to avoid gauntlet tracks and reduce the use of turnouts, since the few million dollars in upfront cost and the maintenance costs could make the difference between a $1.5 million/km line and a $5 million/km line. But when you’re building urban subways, the dominant factor in cost is the underground civil structures, and those are orders of magnitude more expensive than terminal interlockings. I agree, and interlockings should be included where necessary. But including them so that the project can be split into tiny phases of one or two stations at a time is wasteful. Seriously, you can always decommission the old crossover and move it to the new location. These are not complicated interlockings. This isn’t the terminal interlocking at Grand Central; this is a bog-standard scissors crossover. Yes, you have to reprogram the signals, and that costs some. I know I know. It’s beating a dead horse. But when are we going to finally look at alternative funding sources? We look at here at DC adding an infill station at New York Avenue or building the silver line to Dulles without understanding the way that the property owners directly affected by those expansions have funded (and spearheaded) those projects. A few years ago, Yonah Freemark suggested that following the completion of Phase 2, a 125th St crosstown extension be considered before Phase 3. He suggested running to Broadway, but a shorter version terminating at St. Nicholas Ave would be cheaper — about a mile of tunnel and two new stations at Lenox and St. Nicholas to connect to the 2-3 and A-B-C-D: about 2/3 of the work of Phase 1, perhaps, therefore 2/3 of the cost? — and provide most of the value. If Phase 2 does get completed (which, I think, is fairly likely) and MTA concedes that Phases 3 and 4 simply aren’t going to get done (which is less likely), then it seems to me that some variant of Yonah’s idea would be worth pushing. After thinking about 125th Street line, I realized that to obtain the whole benefit, you essentially have to build the whole line in one go to 125th & B’way, since it serves the major destinations of the West Side (City College, Columbia U, the central street of the UWS). There could potentially be issues regarding the transfer to a station so high up in the air. Nevertheless, I think 125th Street line is more likely than Phases 3 and 4. I agree wholeheartedly with your first paragraph, and tentatively with your second. I think a big problem with the cost is work rules and expensive bureaucratic hurdles at every step at every level of government. Wasn’t it mentioned recently on this blog that you have to have 25 guys to bore a tunnel in the US and only 8 to do the same job in Spain? If you triple your labor cost and have armies of people twiddling their thumbs waiting for approvals, that’s a big problem. Infrastructure investment creates jobs, but it would be nice if politicians put the infrastructure itself over the temporary jobs that construction creates. Phase 3 is the real goal here. Phases 1 and 2 relieve overcrowding on the Lexington Line, but fundamentally just help out upper east siders. With its transfers, phase 3 opens up new areas of midtown to every subway rider in the city, especially riders of the F from both Queens and Brooklyn. Phases 1 and 2 should have been built at the same time. Phases 3 and 4 should be split into 3 phases – 63rd to 34th, 34th to Houston, and Houston to Hanover Sq. Each presents more than enough problems to be dealt with at once and also provides enough benefits that each one is useful by itself. Phase 3 as designed is too intimidating for the MTA to pursue. There would just be too many potential complications all at the same time. I’m sorry but I honestly don’t see as currently it would be configured how Phase 3 does anything to help F riders from both Queens and Brooklyn. The only way F riders would experience SAS service is via crosstown platform to the Q train which would only serve the phase 1 and 2 portions. As a matter of fact after 72nd Street the next stop is 55th and a transfer at this point from there to 53rd is still only under consideration but considering the depth of the 53rd Street line at 3rd Avenue they might call it a wash and scrap the thought all together. I’m not sure it’s “every level”. It seems to be only at *some* levels of government. NYC seems to have a perfect storm inflating construction costs, though; you don’t see the same problems in (for a simple example) Minneapolis/St. Paul. Priority #1, take the SAS to 125 St. The reasons advanced for Phase I were to relieve crowding on the Lexington line, and to provide redundancy if or when major repairs and reworking of the Lex becomes necessary. Until Phase II reaches 125 St, it provides no redundancy at all, and not all that much relief to crowding. Reaching the station under 125 St will siphon off passengers coming from the Bronx and heading to West Midtown, and so will relieve crowding further down the 4,5, and 6 lines. It will provide a fully redundant route for when new signaling is to be installed on the Lex or whatever. Stations at “105th and 115th” don’t help; so just SKIP THEM. Hollow out the station space for future completion (what everybody wanted on 41st @ 10th Ave,) but get the T train up to 125 St. When the T reaches 125 St, then we can discuss whether to extend it west to Broadway or further south to 34th St, 14th, or Houston. Sending the Q up to 125th doesn’t make sense to me. The Q should go to Queens. The F should go up to 125th instead. The black tracks are the ones that will lead to SAS. Running the F to 125th and the Q to Queens will require everything to cross. Even if it were feasible which it is not. Forest Hill residents would burn Manhattan to the ground if they lost their train. Never in a lifetime of humanity would they allow that not even if you leveled Forest Hills. I hate to say it but some subway bullets carry increased property values, especially with a particular color. Just ask residents on the M line how they loved the M’s color changing to orange. The color of the M isn’t what mattered; the direct midtown access is. No, on the contrary, it’s better for the F to go to Queens and the Q to go to Upper Manhattan. To see why, look at where the other lines serving the same destinations go. The E serves 8th Avenue, so it’s best to pair it with a line that serves points farther east – either the Q or the F could do that, but the Q is somewhat more duplicative and slower heading to Midtown-south-of-the-50s. And the 4/5/6 serve the East Side, so it’s best to have a line serving SAS that goes to West Midtown and connects to the 1/2/3, i.e. the Q.
saying the stations at 105th and 115th don’t matter and don’t need to be funded is an excellent recipe for never getting them built, as in the 7 extension. not to mention that those are low-income neighborhoods that are sorely underserved. this too. those areas are plenty densely inhabited and could use the service. I think he means in terms of priority…getting the line upto 125 will have a large impact on lessening Lex overcrowding. He did say make all necessary preparations to have stations at those locations, but that its most important to get the line running first. The East Harlem stations matter. They just don’t matter as much as connecting the SAS to the Lex at 125 St. The most underserved low-income neighborhoods are in the Bronx. Their residents are crammed into the southbound Lex every morning. Getting the SAS to 125th would help them greatly. What worries me is when the next mayor, and god helo us, this governor, get pitched to build Phase II, they are gonna get a price tag of, say, $9 billion or so. Let’s say the feds indicate they will cover a third of it, with New York State and City looking at $3 billion each — including a couple of East Harlem stations costing $750 million or $1 billion per. What’s the better option, postponing the whole damn thing until somebody else is in office, or postponing two billion-dollar stations for a few years? Meanwhile speculators and developers already own most East Harlem land, no? When good times return and they want to put up 40-story apartment towers, then Cuomo, Bloomberg, Liu, Quinn, and the others whose campaigns they finance will get the stations built. See: #7 line extension. Getting the SAS to 125th would help them greatly. Doubtful. They will be just as crammed or have more of their time wasted with a transfer. They need new transit services in their own neighborhoods instead of being treated as doormats for suburbanites visiting from the north and legislators in the other boroughs driving to and fro from Albany. The people I know from the Bronx tell me that riding the 4/5/6 from there is pretty sweet. They all get seats, and then the people boarding in Harlem and the Upper East Side are left standing on the packed trains. They also have the shorter rides. It’s the poor(est?) in the South Bronx who have the long rides and seating shortage. They must be coming from pretty far north. The 6 is an interesting case, since most 6 riders from the Bronx get off at 125th for the express. So they get stuck standing, even if they had seats, but anybody who stays on the local gets a seat at 125th. Finishes are relatively cheap. If you’ve hollowed out the station space at 105th and 115th, you might as well build the stations. They’re cut-and-cover anyway. They should NOT be that expensive! They’re not cut and cover. The station space isn’t hollowed out, and Horodniceanu explicitly said that the days of cut-and-cover construction in New York City are over. 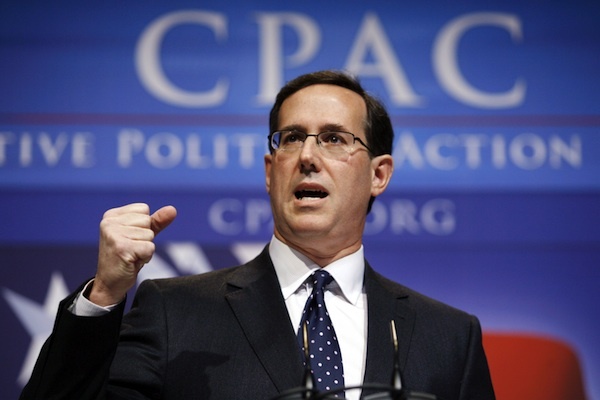 Refusing to do further cut and cover work is downright cretinous. Not only is it cheaper, it allows for more convenient services. Call me crazy, but isn’t cut and cover already going on north of 93rd st? Given how much more shallow the tracks are here, and the (relative) lack of high-rises, isn’t cut and cover more realistic as a cheaper alternative? They are certainly using it somewhat, especially for stations. Maybe that’s because they need to because of work they did in the 1970s? Maybe Horodniceanu just meant it wouldn’t be used for future projects; this was a project that was started a while ago, in a sense…. This is, of course, what Horodniceaniu meant — no new long cut-and-cover sections. Cut-and-cover will still be used for stations and where needed to connect to existing lines; he’s not a moron. 105th and 110th are going to be cut and cover. Look up the damned plans yourself on the website, Benjamin. You are simply 100% wrong. (2) In order to use the tracks from the 1970s, which are cut-and-cover, the tracks through 105th and 115th HAVE to be cut-and-cover. You can’t drop low enough to do bored tunnel and then rise high enough to rejoin the existing tracks in the distance available. Note that the “launch box” is…. wait for it… cut-and-cover. Now, the plan is to go back to mined and bored tunnels for the portion further north towards 125th St.
Or did you mean that they haven’t been cut and covered *yet*? Which is true. I was responding to the proposal to head directly to 125th street and skip the Harlem stations. That proposal doesn’t make sense; because you have to do cut-and-cover work at the 105th and 110th St. locations in order to run the tunnels, you might as well build the stations while you’re there. IMO, going forward, subway construction should prioritize expediting completion ahead of minimizing disruption. I think New Yorkers would rather deal with all of 2nd Avenue from 63rd Street to Houston as one, long, decked-over, cut-and-cover construction site for four years than have to deal with a TBM going on the slow boat to Houston Street for the next twenty years (basically Phase 1 all over again). The MTA needs to realize this, in the same way it’s realizing that seven days of FASTRACK is more cost effective (for them and entire region) than seven months of sporadic weekend disruptions. FASTRACK is not an alternative to weekend disruptions. It’s mostly an alternative to maintenance in between trains, and it’s probably the only feasible way to clear the backlog that developed under Roberts. Doubt if disruption ever figured into the decision to have TBMs grinding away deep beneath 2nd Avenue. Soil conditions and topography dictate the type of tunnel that can be used. But if disruption is the dominant factor, we will need to simply close off 125 St while we push the subway across from Lexington and the MetroNorth Station to Lenox Ave (2,3) to St Nicholas (A,B,C,D) and on to Broadway (#1). No point in being on again, off again there either. Yep, I remember the diagram. One of the key reasons for bored tunnel is that it’s necessary at the south end of phase 1, both to get under the existing tunnels for phase 3, and to connect to the existing tunnels for phase 1. Cut-and-cover is, in contrast, necessary to connect to the 1970s tunnels in the northern section, which have so much length that it saves a fortune to use them. The question of where to switch from bored tunnel to cut-and-cover was made by putting the transition pretty much at the south end of the existing 1970s tunnels, though that’s also a good location topographically. I do not even understand how I ended up here, but I assumed this submit used to be great. I don’t realize who you are however definitely you’re going to a famous blogger in case you aren’t already. Cheers! I’m definitely a fan of the plan that proposes the Nassau Street Line as a substitution for phase 4. Renovations on the line are definitely MUCH cheaper than 5 extra years of tunnel boring, AND the connection to Brooklyn is right there. As someone has pointed out, more trains aren’t needed on the 4th Ave line, so ladies and gentlemen, my crazy proposal: the construction of a small connector tunnel between the BMT and IND tracks at Jay Street-Metrotech. What this would achieve: the T train would travel through the Montague Street Tunnel, then travel down to Church Ave as the long-awaited Culver express. To clarify, I’m not the same as NathanAel, who has written many comments above.